a midline laparotomy in an anaesthetised rabbit, and the rate of closure of each anatomical plane (peritoneum, additional reinforcement, and skin) was measured. The fidelity of a simulator is determined by how much realism is provided through characteristics such as visual cues, touch, the ability to feedback, and interaction with the student. In general, simulators can be divided into two groups: high-fidelity simulators, which are usually highly technical, detailed and realistic; and low-fidelity simulators, which have a low level of realism, are usually made with widely available and low-cost materials, are often portable, and can be used on a table. Despite their simplicity, the latter group of simulators assist the development of psychomotor skills.7 Some limitations of the use of simulators are related to their cost or difficulty in sourcing spare parts. Moreover, despite the large number of simulators that have been developed, few studies have been conducted to evaluate their effectiveness, leaving the concept of teaching through simulators at an empirical stage.8 Therefore, it is necessary to develop inexpensive, easy-to-construct simulators that support the process of surgical teaching, and also to quantitatively assess the effectiveness of their use. 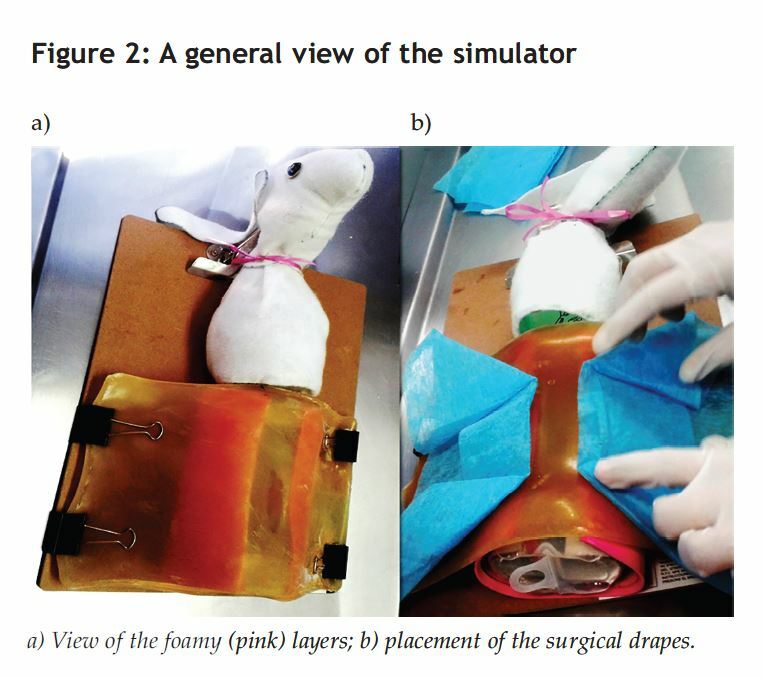 Therefore, the aim of this work was to develop and validate a low-fidelity simulator to assist in the teaching of the correct technique for closing a rabbit midline laparotomy. A 10cm long and 4cm wide opening was made in an empty plastic 500ml solution bottle (Pisa Agropecuaria, Guadalajara, Jalisco, Mexico), leaving protruding areas to represent both the xiphoid process and the pubic symphysis (Figure 1a). To give support to the bottle, an internal cardboard lining was added, as well as three 3ml syringes widthwise (Figure 1b). Two 3mm thick silicone sheets were made by pouring 270ml of PE53® silicone rubber (Poliformas Plasticas, Mexico City, Mexico) into a mould, 23cm long by 13cm wide, which was allowed to set at room temperature for 24 hours. 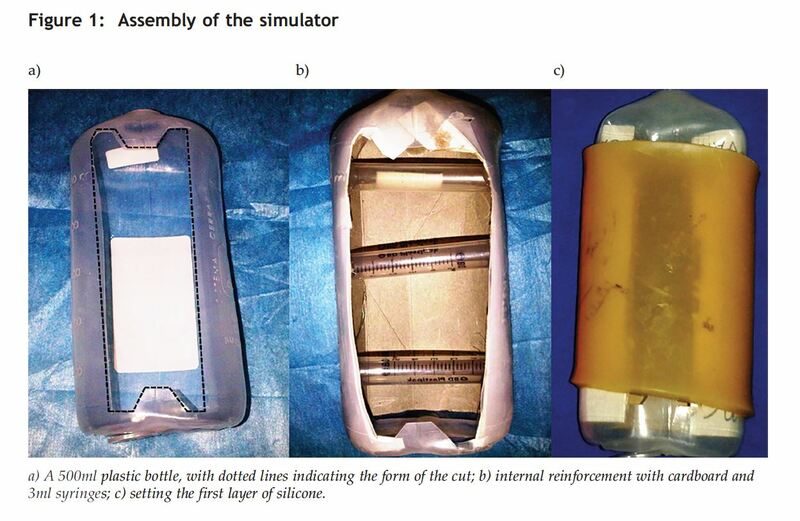 The back-board from a standard paper clipboard was used as the simulator base, with the plastic bottle placed onto the board and the first sheet of silicone overlaid, in order to simulate the peritoneum (Figure 1c). Subsequently, the rectus abdominis muscles were simulated by placing two sheets of 3mm thick × 28cm long × 21cm wide polypropylene around the bottle (Foamy; Mylin, Mexico City, Mexico), leaving a gap of 3cm in width along the entire midline. Finally, this layer was covered with the second sheet of silicone to simulate skin, and both sheets of silicone were tightened onto the clipboard base with paper clips (Figure 2a). The appropriate size head, thorax and abdominal organs were fashioned from cotton fabric and added to the simulator prior to use (Figure 2a). Thirty-five students in the third year of a veterinary medicine and zootechnics course at the Universidad Autónoma Metropolitana, Unidad Xochimilco, with no previous experience in surgery, received a 120-minute theory session, supported with slides, on the midline laparotomy technique and suture in rabbits.9 This was part of the Surgical-Veterinary Therapeutic Bases module. Later, the students were divided into two groups: the experimental group (n = 16), which was organised in four surgical teams of four participants each, and the control group (n = 19), which was divided in four groups of four participants and one three-participant group. Each student was assigned his/her rotation within the group, in such a way that they all covered all the roles once (surgeon, first assistant, scrub nurse, and anaesthesiologist). Each surgeon/first assistant team (according to the assigned rotation) of the experimental group used the laparotomy simulator two days prior to the practice on the live animals. They were asked to repeat three times the following procedure: put the surgical drapes in place (Figure 2b); perform a 7cm incision, including all the layers of the simulator; suture, with continuous stitches, the first silicone layer (peritoneum), which was reinforced with inverted ‘U’ stitches; and suture, with Sarnoff stitches, the second silicone layer (skin). The first assistant was only allowed to help the surgeon in handling the surgical instruments that were used. The closure of planes was performed by using nylon 2-0 suture (Figure 3). 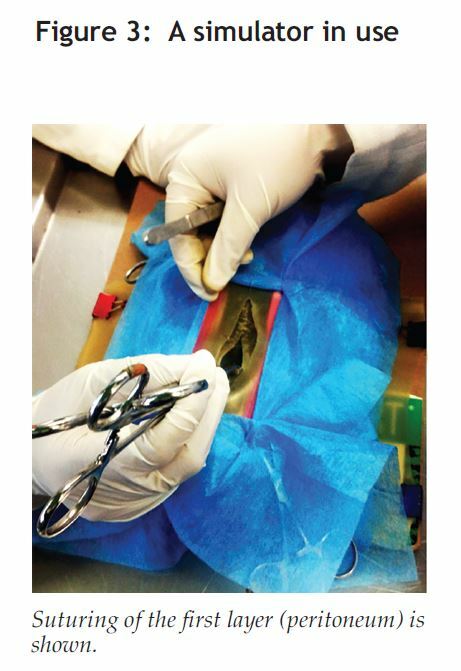 Subsequently, the participants of both groups performed midline laparotomies on 35 clinically healthy New Zealand rabbits (Oryctolagus cuniculus), suturing midline (peritoneum) with continuous stitching, reinforcing (muscular fascia) with inverted ‘U’ stitches, and suturing the skin with Sarnoff stitches, all performed under general anesthesia, according to the method previously described by Perez-Rivero and Rendón-Franco.10 Both the control group and the experimental group performed one surgery weekly. In total, evaluations were completed in 4 weeks (i.e. one week for each participant from each team). Since the lengths of the incisions were different in all the cases, the rate of closure of each anatomic plane and all planes in total, was calculated as follows: the length of each incision was measured (in centimetres), and this was divided by the time (in minutes) taken to complete the suturing. The result was expressed in minutes per linear centimetre of incision (MLCI). During the whole process, each group was supervised by two professors and five assistant instructors. Students having the prior role of first assistant, scrub nurse, and/or anaesthesiologist, would have previously observed and/or helped in the performance of the laparotomy. This could have resulted in an improvement in their performance when participating as actual surgeons. To rule out these effects, total MLCI values were compared among the members of each group, according to whether they acted as the surgeon in week 1, 2, 3 or 4, to ascertain whether there was a significant difference in their surgical proficiency, by using the one-way ANOVA with a significant value p < 0.05. Comparisons of the proficiency of group members according to the week in which they acted the role of surgeon did not show a difference (p > 0.05), supporting the idea that observation and/or assistance did not improve technique. When comparing the MLCI values of each plane as well as total MLCI values between the control group and the experimental group, all were different (p < 0.05) with a higher rate of closure for the experimental group. 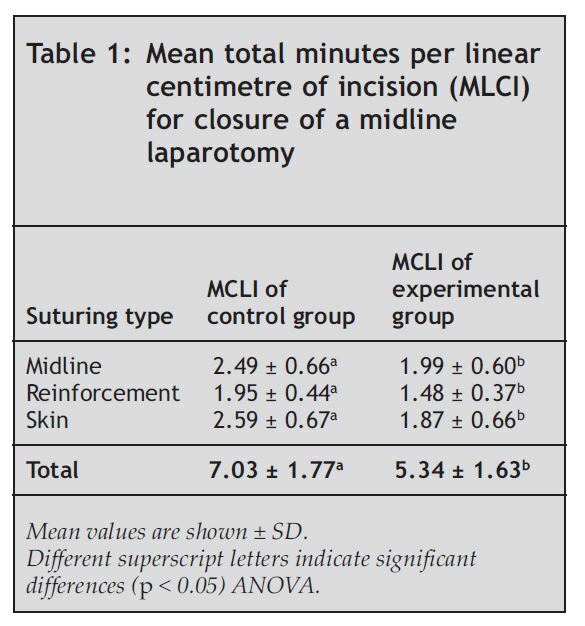 The MLCI values of each group, as well as their comparisons, are shown in Table 1.
suturing skills in a laparotomy. On the other hand, the experimental group demonstrated better suture skills for the laparotomy in rabbits after performing three repetitions of the procedure in the simulator. These findings agree with those reported by Aggarwal,12 who found in his study that laparoscopic surgeons required two repetitions of a particular procedure in a simulator, in order to learn it. The simulator required them to hold the tissue, lift it up, place a clip, and then cut; for trainees, seven repetitions were required to learn to perform the same procedure. However, we have to take into consideration that this particular procedure would have a longer learning curve than performing a suture. More studies are required to determine the time and number of necessary repetitions in training with these bench simulators, in order to reach an adequate level of proficiency. Further work will also be needed to make the simulators more realistic, and to investigate ways in which to take maximum advantage of this training tool. 1 Langebæk, R., Eika, B., Jensen, A.L., Tanggaard, L., Toft, N. & Berendt, M. (2012). Anxiety in veterinary surgical students: A quantitative study. Journal of Veterinary Medical Education 39, 331–340. 2 Smeak, D.D. (2007). Teaching surgery to the veterinary novice: The Ohio State University experience. Journal of Veterinary Medical Education 34, 620–627. 3 Russell, W.M.S. & Burch, R.L. (1959). The Principles of Humane Experimental Technique, 238pp. London, UK: Methuen. 4 Martinsen, S. & Jukes, N. (2005). Towards a humane veterinary education. Journal of Veterinary Medical Education 32, 454–460. 5 Kumar, A.M., Murtaugh, R., Brown, D., Ballas, T., Clancy, E. & Patronek, G. (2001). Client donation program for acquiring dogs and cats to teach veterinary gross anatomy. Journal of Veterinary Medical Education 28, 73–77. 6 Valliyate, M., Robinson, N.G. & Goodman, J.R. (2012). Current concepts in simulation and other alternatives for veterinary education: A review. Veterinarni Medicina 57, 325–337. 7 Perez-Rivero, J.J. & Rendón-Franco, E. (2012). Experience of the use of table-top simulators as alternatives in the primary surgical training of veterinary undergraduate students. ATLA 40, P10–P11. review of present, past, and future. Surgical Endoscopy 24, 536–546. 9 Griffon, D.J., Cronin, P., Kirby, B. & Cottrell, D.F. (2000). Evaluation of a hemostasis model for teaching ovariohysterectomy in veterinary surgery. Veterinary Surgery 29, 309–316. 10 Perez-Rivero, J.J. & Rendón-Franco, E. (2014). Cardiorespiratory evaluation of rabbits (Oryctolagus cuniculus) anesthetized with a combination of tramadol, acepromazine, xylazine and ketamin3. Archivos de Medicina Veterinaria 46, 145–149. 11 Hammer, Ø., Harper, D.A.T. & Ryan, P.D. (2001). PAST: Paleontological statistics software package for education and data analysis. Paleontología Electrónica 4, 1–9. 12 Aggarwal, R., Grantcharov, T.P., Eriksen, J.R., Blirup, D., Kristiansen, V.B., Funch-Jensen, P. & Darzi, A. (2006). An evidence-based virtual reality training program for novice laparoscopic surgeons. Annals of Surgery 244, 310–314. 13 Denadai, R., Oshiiwua, M. & Saad-Hossne, R. (2014). Teaching elliptical excision skills to novice medical students: A randomized controlled study comparing low- and high-fidelity bench models. Indian Journal of Dermatology 59, 169–175. Should foetal tissue be used for medical research? PiLAS has been made possible by a grant from the Phoebe Wortley Talbot Charitable Trust.